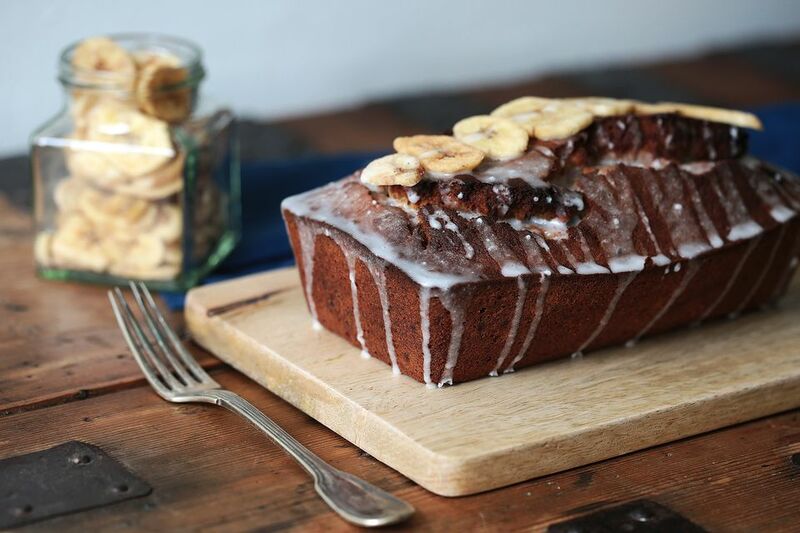 This spiced banana loaf cake is a great dessert for banana lovers. The included vanilla icing makes a delicious glaze for the cake, but it could be served with a caramel dessert sauce or a dusting of powdered sugar as well. The cake is moist and delicious either way! This easy recipe makes three small loaves, one for the family, one for a potluck, and one for the freezer. Grease and flour three 8 1/2-x-4 1/2-inch loaf pans. Heat oven to 325°. In a medium bowl, mash bananas and pour vegetable oil over them; set aside while making the cake. Cream the 1/2 cup of butter and granulated sugar; add eggs, one at a time, beating well after each addition. Stir in banana and oil mixture; mix well. Combine dry ingredients in a separate bowl and use a whisk or spoon to blend thoroughly. Add the dry mixture to creamed banana mixture and blend well. Fold in raisins and pecans until well incorporated. Spoon mixture into the prepared loaf pans and bake for 50 to 55 minutes, or until browned and a toothpick comes out clean when inserted in the center of a loaf. Cool the cakes on racks. Drizzle with icing (below) or sift powdered sugar over the cakes. Combine the melted butter with powdered sugar. Add 2 tablespoons of milk and the vanilla extract and beat until smooth. Add more milk, as needed, to make a drizzling consistency. Drizzle the icing over the cooled cakes. To freeze a loaf (iced or not), place it on a baking sheet and freeze until solid. Wrap the frozen cake in foil and place it in a freezer bag. Label with the name and date and freeze the cake for up to 3 months. Or freeze the cake in individual portions. Wrap and seal in a bag. Unwrap and thaw the cake for 2 to 3 hours at room temperature.